So. Last night was fun. Lots and lots o’ fun. The rumor about Marlboro Man making an appearance was true. 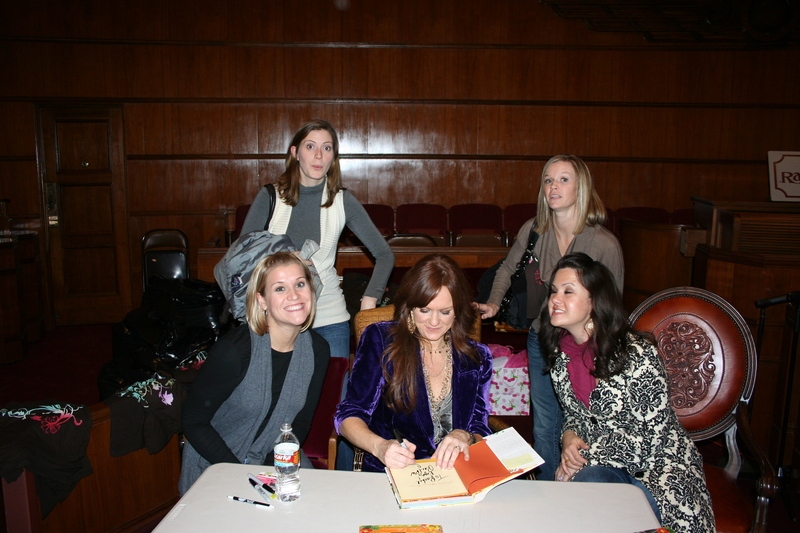 Pioneer Woman, once again, was extremely kind and gracious. She’s just so stinkin’ like-able. She answered lots of questions submitted from the gigantic crowd of women, drew names for door prizes, then began signing books. And I mean lots of books. If I had to guess I would say at least 1,000. The place was packed with P-dub fans. Her hand had to have cramped up at some point, but she powered through, never once letting her smile leave her face. Oh, and get this. As I was getting ready last night, I decided I needed to wear a warmer coat than the black and white one I had on at the morning signing. But then I remembered that PW had actually complimented me on my coat that morning, so I decided to do an experiment to see if she would remember me. Of course, it was only because I sacrificed my warmth and wore a coat that sticks out like a sore thumb, but still. She remembered. Such a sweet BFF, she is. Here’s our crew with PW. Please take note of how Rachel’s hand is slyly reaching out to touch PW’s arm. Rachel, are you going to ever wash that hand again? It was a super fun night with some super fun girls. I’m not sure, but in this adorable gaggle of groupies, I think there was enough cheesy to go around a couple of times. You girls certainly know how to have a good time!! I LOVE the last picture! I laughed out loud! What fun! Did you happen to see the news yesterday?! Yup, that’s right, yours truly was on it with PW… no joke. I laughed out loud. SO glad she came to KC… fun to see you yesterday at both events!! I totally forgot and just went ahead and washed my hands! What was I thinking?! But it totally adds a BFF dimension to our pic! I love it. You crazy stalker woman! oh you made me laugh. i’m glad your dreams were fulfilled! btw, i think you should buy her a ying yang necklace for sure. she’d really enjoy that. I know this is an old post, buuuuut…. YOU GOT A PICTURE OF MM!! I am so happy! I love me some PW too but she never photographs the man. Rude! What a fun time for you!